A gull is a water-dwelling bird you surely know if you have ever been to the beach. It’s also called a seagull and it’s usually white with gray or black upper wings. But did you know gull is also a verb? It is somewhat dated now, but it means ‘to deceive, trick or cheat.’ The related noun gull, also somewhat dated, is used to refer to someone who is easily tricked or cheated. A flock of gulls followed the fishing boat. The protestors complained that the government was trying to gull the public. The conmen gulled George into handing over all his savings. That guy is such a gull; he'll believe anything you tell him. 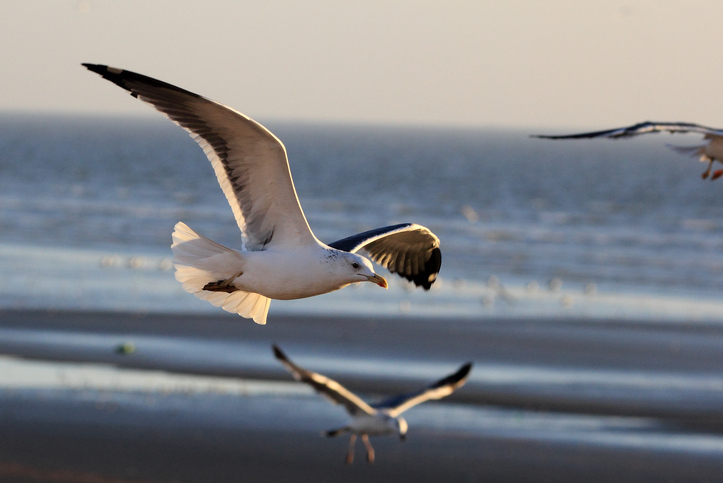 Gulls are a familiar sight at the seaside, but in many coastal areas they are gaining a bad reputation. This is often due to tourists feeding them, which means they associate people eating with being fed and swoop down on anyone they see holding a sandwich or an ice cream. They can also become aggressive when they are nesting. However, this article, from 2015, suggests they don’t deserve the bad rap they get and that humans are largely responsible for the problems. Gull, the noun meaning a type of shore bird, dates back to the early 15th century. It came into English from a Celtic source (possibly Brythonic Celtic), and replaced the Middle English name for these birds, mew (mœw in Old English). It can be traced back to the Old Celtic root voilenno-, and is related to the Welsh gwylan, the Cornish guilan and the Breton goelann (all meaning ‘gull’). Gull, the verb meaning ‘to cheat, mislead or dupe’ someone, is completely unrelated to the bird. It dates back to the early 16th century, and it originally meant ‘to swallow.’ It came from an early verb, gull, which is related to gullet (‘throat,’ which you may remember was also related to another word we covered, gully). The figurative sense, ‘to deceive’ (by having someone swallow a lie) took over by the mid-16th century, and became the main sense. Gull, a noun meaning ‘credulous person,’ ‘sucker or dupe’ dates back to the late 16th century, but its origin is uncertain. Many linguists see a natural link to the verb gull. While this may be the case, others have also linked it to the shore bird (with the idea of someone who will swallow anything thrown at them). A third option is that it came from goll or gull, a Middle English noun (used up to the late 14th century) meaning ‘newly hatched bird,’ with the same figurative play on someone swallowing anything given to them.